The Research & Development Tax Credit is a federal benefit (also available in many states) that was enacted to promote growth, innovation, and inspire advancements in all areas and facets of business. The credit is an undoubtedly beneficial incentive for businesses large and small. However, many companies are hesitant to take advantage of the credit out of fear of a possible IRS audit. This is a common misconception. The truth is that an R&D Tax Credit study on its own does not trigger an IRS audit. The audit risk involved in a study is incorrectly filed or unsubstantiated R&D tax credit claims. Properly detailed documentation goes a long way toward the sustainability of the credits claimed, which minimizes time, effort, and stress under IRS audit. Working with a qualified, ethical firm with integrity can abate many issues that could arise during an audit. Companies need to select a provider that can ensure the highest standard of documentation prepared during the study. Learning what to expect and how to be prepared in the event of an audit is highly recommended. On Wednesday, June 5th, we are hosting a new webinar, R&D Tax Credits and the IRS: How to Prepare for Audit instructed by our R&D Tax Credit Director and former IRS Senior Analyst and Engineer, Jack Jolly. 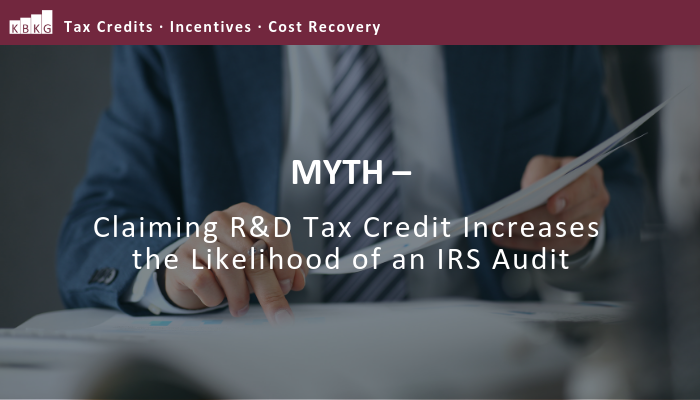 This webinar provides the latest insights into what businesses might encounter if the IRS audits the R&D tax credit filing claims. Jack Jolly recently retired as a federal employee after 32 years. His first 12 years were with the Department of Defense as a production engineer at an Army maintenance depot where the primary mission was the overhaul of combat vehicles. His last 20 years were with the IRS in the Large Business and International Division. He served as a field engineer, engineer team manager, territory manager, and senior analyst. Jack was the lead instructor for several classes where new engineers were taught their role in examining basic and advanced IRS issues. The majority of his time at the IRS was dedicated to the examination of the research tax credit in various industries, including automotive, utilities, chemical, and others.